We are often stopped when we are out with her- Mostly by people who comment on her beauty, but often People ask us why she is so small. She is on the small side as our last GSD female was about 65 lbs and we painfully lost her at just about age 10 to hip dysplasia and old age so we are ever so hopeful that our little Sofi may live longer because of her lighter size. Hey Mary, Thanks so much for sharing the story of your petite little girl with us. Your little Sofi really is small compared to most other GSDs of her age however the standards we so often go by do have dogs that are on the higher and lower end. And your sweet little girl is definitely on the low end as far as size goes. That's ok though. A long as Sofi is healthy, happy, playful and your vet seems to have given you the "all's well" for her health wise, I wouldn't worry about it so much. Currently she is still considered a puppy. Now I haven't seen her in person, or have actually gotten my hands on her (which I always like to do ;)), but I can tell you, that if she follows the pattern of growth as all other German Shepherds I have dealt with have, that she will probably fill out a little more and maybe put on some more weight as she becomes a fully adult female GSD - normally around 2 to 3 years of age for most German Shepherd Dogs. Normally males do this around the age of 3 or later. I wish you much luck and continued success with your little girl. 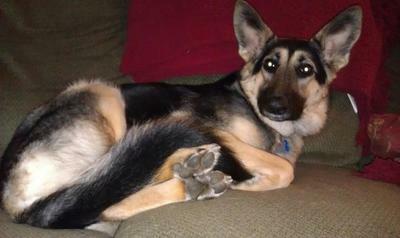 Sofi is a beautiful, petite German Shepherd and I'm sure she's a wonderful part of your family. Keep us up on her development down the road - I'd be curious to see how she matures down the road. Sofi has filled out and now 2 months shy of 5 years old she is 60 pounds. People still think she is a puppy, since her face is still youthful. We have a small girl too. She always gets alot of attention from others. She is 11 months and 50 pounds but everyone asks is she a puppy. She looks petite, so cute and great coloring of red and black. It is good to learn she may fill out more at 2-3 years. Sofi is about the same size as my girl Holly. I know her breeders and am still in contact with her litter mates families. They are all average sized. Holly is the only small one. As long as she is happy , your vet is happy and your happy that is all that matters. Just like humans not everyone is 6ft tall. I also own her brother from her parents next litter and he has just turned 1 and weighs approximately 90 pounds. And he too is perfectly healthy. I bought a akc german shepherd from an amish guy in Ronks pa(puppy mill central). I wanted a dog that would protect my home, trainable and have that aloof german shepherd personality. Instead I got a dog that has separation anxiety, hyperactivity , non-protective super loving and friendly to everyone (great for a friendly neighborhood with kids but not the ghetto with crackheads). He looks just like your dog. Im really angry and feel like Ive been ripped off. The average gsd weighs 100lb, 48lb is to far off to be considered a gsd. That's not a pure gsd. Im just being straight with you. Hope you didn't pay too much. You should ask if the breeder breeds other dogs also like border collies cause they have a rough double coat too. You got a mixed breed, being straight up with you do what you want with the info. AKC pappers don't mean anything, they don't care if dogs are pure or not. Sofi is a very pretty girl! Being of a smaller size - petite; than the normal weight - would that be same in the dog generics as it is in humans? As long as she is Healthy and Happy I wouldn't worry about it too much, it is the way God made her. I would feed her a Preminium dog food, such Pro Plan. Mia my Beautiful Shepherd has been on ProPlan since I got her at 12 weeks old, she now 2 1/2 years and weighs about 67 lbs. I swithced her from IAMs nothing wrong with it and it is Preminium food but I am a Purina person and always will be, I trust Purina! Nutrients is very important in her puppy stage for development into adulthood. So if do change her food for whatever reason and brand of your choice a Preminium food, do it gradually add the 1/3 of the new food to the current food for about a week than gradually add more new food till old one is gone. Her body will have time to adjust and will no problem such as diarrhea. Take care of your Precious girl Sofi and she will take care of you!